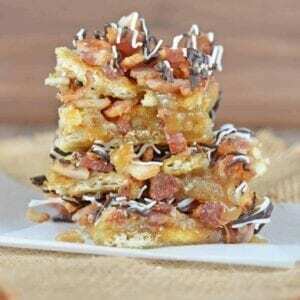 Chocolate Bacon Saltine Toffee is additively delicious, easy to make and the perfect addition to any holiday cookie tray! Preheat oven to 400 degrees. Line a 9x13 baking dish with parchment paper, carefully folding the edges so you can easily lay the crackers flat. Line baking dish with crackers. In a medium saucepan, heat butter, brown sugar and maple syrup over medium heat, stirring frequently until fully combined and smooth. Do not boil. Pour over crackers, top with crumbled bacon. Bake for 10 minutes. Remove and allow to cool to room temperature. Melt both white chocolate and milk chocolate in plastic candy bags. Snip ends and drizzle over bacon. Place in the refrigerator until hardened. Remove parchment paper and cut into squares.